Rev. 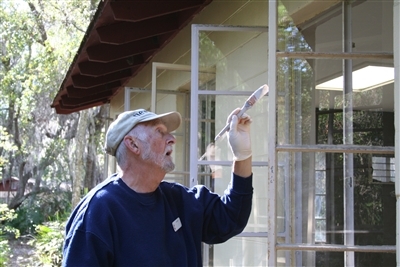 Gary Judson, a retired pastor working with NOMADS, helps transform a former storage building into a nature center for kids who attend Warren Willis Camp this summer. FRUITLAND PARK – Keeping the peace can be hard, even labor-intensive. The pastoral settings of the camps and retreat centers operated by the Florida Conference might look natural, but they don’t stay that way without human intervention. They require grounds-keeping, housekeeping and structural maintenance. All that upkeep can run up quite a tab for the retreat ministry. Enter the NOMADS and Workampers, travelers who often are retired and seeking a place in the sun to ride out harsh northern winters. 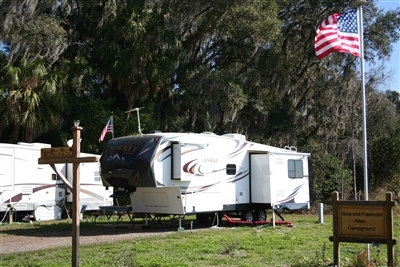 In exchange for a set number of work hours per week, people who register and are approved can park their recreational vehicles and receive full or partial hookups to utilities at Florida Conference retreats, as well as United Methodist churches and affiliated ministries that have amenities to offer. Some stay for a few weeks, others for several months. Rev. Gary Judson and his wife, Jeanne, were among dozens of workers assigned to Warren Willis Camp this winter through Nomads on a Mission Active in Divine Service, or NOMADS. They helped transform a former cabin used for storage into a nature center for this year's summer camp. "It's a wonderful way to spend our retirement," said Jeanne Judson, who added that the couple joined NOMADS, a UMC outreach program, about nine years ago to continue ministry while they escape the cold winters of New York State. "Our dogs travel with us. … We all have a good time." 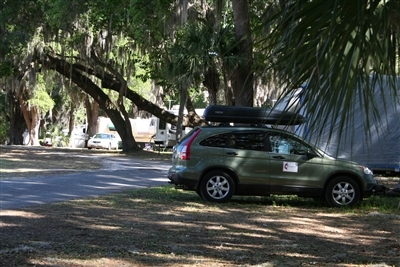 Florida Conference camps recruit extra help by offering free hookups like these at Warren Willis Camp for RV owners willing to work. Her husband logged 40 years as a pastor and district superintendent before retiring, but he said he still wants to engage in ministry. "NOMADS is one of the best-kept secrets of The United Methodist Church," he said. He and others interviewed said they enjoy meeting new people and experiencing fellowship through the program, which usually matches workers to three-week assignments. Conference camps directors said they also recruit workers through www.workamper.com, which posts jobs that RV travelers can apply for. The directors estimated they would have to hire eight or more staff members to accomplish what the itinerant workers do. They said the program started in 2005 with maybe two couples and has grown to about 70 people a year working in exchange for an RV campsite at Warren Willis or the Life Enrichment Center (LEC) across the street. "In past years, LEC has struggled to break even financially," said Rev. Jess Schload, the center's director. "A major part of that issue was the high number of staff needed to operate this ministry. … In 2008 we reduced staffing by nearly 50 percent, and the work campers picked up the load." He and Mike Standifer, executive director of Camps and Retreat Ministries, said they discovered that workers recruited through work-for-campsite programs did more than replace former staff; they enhanced the ministry. Schload said some workers set up fundraisers to pay for extras to enhance the retreat facilities. 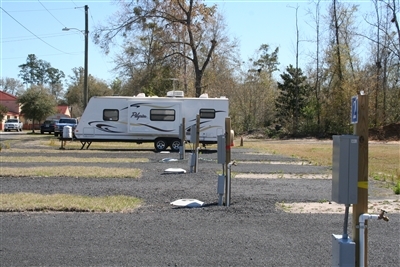 RV hookup sites, like this one at the PET (Personal Energy Transportation) Project facility in Penney Farms, Fla., are being used by many ministries to recruit labor from retired Christian travelers who want to mix worthy effort with relaxation. "They add another wonderful aspect to the ministry, and that is a passion and love for LEC and what we do," he said. "They are great ambassadors for the ministry." Said Standifer, "It truly has allowed us to provide much more care for our customers and our guests than we really had the ability to do before." The camps also receive significant assistance from local volunteers, but work campers are subject to higher expectations. "We interview them as we would everybody, whether we're paying them or not," Standifer said. Generally, each full hookup "costs" 24 hours a week in service at the camps. The hours can be served by one person or shared by a couple. "The vast majority of them are going to do more," said Billy Thompson, facilities manager at the LEC and Warren Willis Camp. "They want to be here giving. They don't want to be cooped up in their RVs." The camps welcome people from all walks of life, but sometimes the skills campers bring to the ministry seem providential. Thompson recalled a worker named John Lundin who transformed an orange grove on the Fruitland Park property from an overgrown mess to a productive enterprise that provides fresh citrus to local food banks. More recently, itinerant workers have been helping the conference get a bigger bang for its buck with ongoing renovations of accommodations at the LEC. 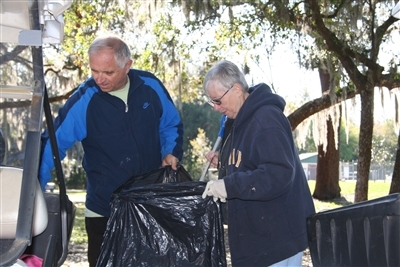 Bob and Janet Koptis, retirees from Augusta, Ga., help clean up at Warren Willis Camp in exchange for an RV hookup site. Last summer, when the Warren Willis pool sprang a leak, Bob and Janet Koptis showed up. The couple had retired after 33 years in the pool maintenance business in Augusta, Ga. They repaired the pool and stayed on to keep it clean through summer camp. They plan to do the same this summer. "We don't feel like we're working," Janet Koptis said. "It's camp." Added her husband, "This is like family here. It's just giving back." Thompson said yet another couple took a work assignment in exchange for a campsite, fell in love with the area and ended up buying a home nearby. Now the husband, a carpenter, reports for volunteer work every Monday at the retreat center. Nationally, NOMADS counts more than 1,100 members in 47 states plus Canada, according to information provided by Carla Kinsey, the program's administrator. Membership dues are $40, payable annually on March 31. Workers from NOMADS get a spot in the shade for their RV at the Life Enrichment Center in exchange for working in the kitchen, on the grounds or in the office at the retreat. Members completed 152 projects in 31 states last year, with labor valued at more than $2.4 million. Most members are assigned to a team that works at one site for three weeks, but some assignments – especially disaster rebuilding – can be shorter or longer, Kinsey said. Florida projects are among the most popular, she said. "Some of the Florida locations [hosting NOMADS] have been partners for well over 15 years," she said. "We get almost 100 percent positive responses from our partners." Kinsey said some churches have sent NOMADS workers to help neighboring poor or elderly maintain their homes. "We're trying to help churches take that step into community outreach," she said. Most members are United Methodists, but other Christians are welcome. For information about NOMADS, visit www.nomadsumc.org. * Susan Green is the editor of Florida Conference Connection.